Microsoft has introduced many new features, numerous enhancements in new Windows 8. Windows Theme pack also changed to a new format with an extension of .dekthemepack.This new format prevents all Windows 7 users to install Windows 8 Themes in their system. Windows 8 themes has new panoramic themes, and many modern Metro styled themes. All theses Windows8 Themes are come with *.deskthemepack extension. This format is not compatible with Windows 7. You have make that compatible with Windows 7 to installed Windows 8 themes in your Windows 7 system. For that, I have found the new utility named Deskthemepack Installer. It will make all Windows 8 themes compatible to Windows 7. This gives you the ability to install Windows 8 Panoramic and other themes in Windows 7 system. First, Download Deskthemepack installer and run the application anywhere. Since it is portable, you don’t need to install it in your system. The application has the very simple and minimal user interface. It has only 3 options. Install a deskthemepack file – This option allows you to browse for the saved Windows 8 Theme in your computer and installs it into your Windows 7 system. 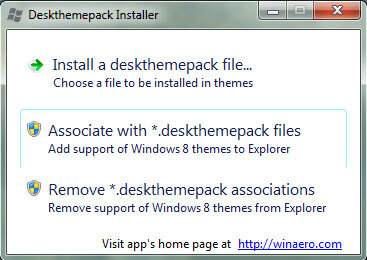 Associate with *.deskthemepack files – installs an association for .deskthemepack theme files in Windows 7. You will be able to apply Windows 8 theme just like regular theme pack of Windows 7. Remove *.deskthemepack associations – removes the association which was set with an option mentioned above. I thins those options are pretty much simple, and anyone can easily use this tiny application in Windows 7. This software does not provide an auto colorization of window frames and/or panoramic view of wallpapers like in Windows 8. Just it converts the Windows 8 themes to Windows 7 compatible themes. Using Associate with *.deskthemepack files option to associate the default Windows Theme Personalization manager. After that association, you should not move the Deskthemepack Installer to another folder. If you have done it, then you have to you have to run Deskthemepack Installer from new location and click the Remove *.deskthemepack associations button and then click Associate with *.deskthemepack files again. This tool supports Windows 7 Home Premium, Professional, Enterprise and Ultimate.